The key invention that ushered in the Neolithic Age was farming. This invention fundamentally changed the fabric of Mesolithic society because people no longer had to spend all their time hunting, and they were less likely to go hungry when game was hard to find. Additionally, they could built much larger, more permanent dwellings and, perhaps most importantly, this was the first period that people had enough 'spare time' in which to innovate. It would be a mistake to think that the Mesolithic people of Ireland suddenly invented farming and became Neolithic. Rather, Ireland's Mesolithic hunters were displaced or assimilated by Neolithic settlers who gradually arrived in Ireland from Britain and brought the technology with them. The practice of farming had spread from the Middle East, through eastern and southern Europe to reach Britain around 4000BC. Again it seems that it arrived in Ireland via the Scotland-Antrim link. Evidence from Cashelkeelty, county Kerry, suggests that this happened between 3900BC and 3000BC [4 p28]. The Neolithic settlers set about clearing upland forest (which was thinner and easier to clear than lowland forest) with stone axes, or by burning it, in order to build their permanent farms. As Ireland did not have many native cereal crops, and wild pigs were the only farm animals native to Ireland, the settlers brought with them cows, goats and sheep. It is conjectured that these aninals were transported across the Irish Sea on wooden rafts towed by skin-boats or dugout canoes (hollowed tree trunks). They also brought wheat and barley which they planted in their farms. The newly-cleared upland was used for agriculture, but erosion and overgrazing was soon to cause it to stagnate, acidify and eventually evolve into peat bogs. Thus most of Ireland's upland peat bogs (although not the lower ones) are actually artificial features inadvertently created by Neolithic farmers. Another piece of new technology introduced to Ireland by the Neolithic settlers was the use of porcellanite. This is a rock that is tougher than the flint used by the Mesolithic Irish. It can be used more effectively for making axes, digging tools etc. They found that they could chop down much larger trees than they could with flint tools, and this allowed them to more effectively clear Ireland's upland forests. Porcellanite was mined almost exclusively in county Antrim, in northern Ireland, and two sites have been excavated by archaeologists: Rathlin Island and Cushendall. Axes from these 'factories' have been found mainly in Ulster, but also across Ireland and as far away as southern England. This suggests that, far from being isolated, the Neolithic Irish farmers were trading with Neolithic Britons. As the Neolithic farmers were not moving around, they were able to build larger and more permanent dwellings. A Neolithic house was rectangular and made either from tree trunks sunk vertically into the ground or from woven branches covered with mud. The gables at each end were supported by a large beam leaning against the ridge of the roof. The roof itself was made from timber beams with reed thatch covering it. 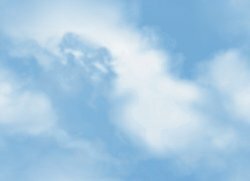 A small hole in the roof allowed smoke to escape because, unlike the Mesolithic Irish, the Neolithic farmers lit their fires and cooked indoors. 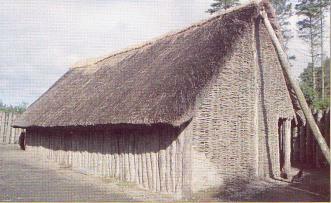 An excellent reconstruction of a Neolithic house can be seen at the Ulster History Park near Omagh, county Tyrone, and this is pictured above. Note the wattle-and-daub gable wall with the daub (dried mud) removed so that you can see that it is made from finely woven sticks (wattle). Note also the enclosure fence made from a series of vertical logs. We know what these houses looked like because, although most of the wood itself has gone, the post-holes have survived and engineers can thus determine the house's structure. One final technology that the Neolithic settlers brought to Ireland was pottery. Enough fragments of Neolithic pots have been found in Ireland for it to be reasonably certain how they were made. They were usually made by coiling clay round and round to build up a simple pot shape. These were then smoothed down. Some pots have been decorated by pressing stones, sticks or even fingers into the wet clay. The pot is then hardened by placing it in a hot fire. The pots were used for many things; as well as for storing food, a pot filled with a small amount of fat and set alight was a simple but effective lamp. One of the most important legacies left by the Neolithic farmers was their megaliths, or large earthen constructions, used primarily as burial places. The emphasis placed on these megaliths in literature is mainly due to the fact that they are the only things to have survived largely intact from the Neolithic era. They can thus give us the best clues to Neolithic life, and while they do perhaps over-emphasise the role of burying the dead in Neolithic society, it was also true that burials seemed to have played an important part in Neolithic society. Not only do the megaliths provide many artefacts such as burial objects, but by digging into their constituent material scientists can learn about the climate and vegetation that existed at the time they were built. Megaliths are not unique to Ireland - they can be found in a broad sweep of western Europe which includes Spain, Portugal, western France, Denmark, Ireland and parts of Wales and Scotland. Nevertheless, with over 1500 recorded megalithic tombs still in existence in Ireland, it is an important aspect of Irish history. The later peoples of Ireland would wonder at these huge enigmatic constructions and frequently attributed them to giants, giving rise to the proliferation of giants in Irish mythology. The construction of megaliths did not commence with the first Neolithic settlers. Rather, their construction began several centuries after the first arrivals, around 3500BC. They are heavily concentrated in the north of Ireland and can be broken down into three clear types which may be evidence of primitive religious or political groupings (although that term must be used very loosely). Court tombs are found almost exclusively in the northern half of Ireland: in Ulster and northern Connaught and probably represent the oldest Neolithic constructions. Built mainly in upland areas, a Court tomb basically consisted of a segmented stone chamber covered by an earthen mound, with an entrance courtyard that almost invariably faces east. Today, the earthen mound is usually long eroded away leaving the internal stones of the tomb exposed. While the term 'tomb' is used, it must be said that there is evidence that these structures may possibly have served as temples, rather than simply tombs, and may have been used frequently. Rarely has any intact pottery been found in a court tomb. The best examples of court tombs are Annaghmare, in county Armagh, Magheraghanrush, county Sligo and Tullyskeherny, county Leitrim. There is a large concentration of court tombs in a small area of north county Mayo with other concentrations in counties Sligo, Leitrim, Tyrone and Antrim. The picture is of the court tomb at Deerpark, county Sligo (image ©Department of Arts, Culture and the Gaeltacht). 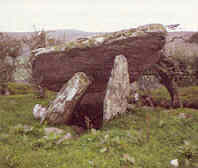 Portal tombs, or dolmens, are found mainly in the northern half of Ireland, but also in the Wicklow - Wexford - Waterford area and around Galway Bay. Probably originating in the east Tyrone area, they may have developed from court tombs. They consist of three or more vertical stones on top of which is perched one or two huge capstones. The capstones always lean down towards one side, leaving a large opening at the high end. Many have collapsed in the intervening millenia, but they remain one of the most striking forms of megalith. Originally, human remains would have been interred inside the tomb and the entrance sealed with smaller stones, most of which have disappeared in the time since. The best examples are to be found in the Carlingford Lough area of counties Down and Louth. The photograph above shows the portal tomb at Glenroan, county Tyrone (image ©Department of Environment Northern Ireland). Passage Tombs are found in eastern and northern Ireland, although there are a few examples in the south and west. They were built by later Neolithic settlers, probably from western France, and tend to be architecturally more adventurous than court or portal tombs. They consist of a roughly circular earthen mound under which is a central chamber and a passage leading into it. The passage is made from large vertical stones with flat stones laid across them and then covered in soil. In larger examples, the roof of the central chamber tapers in a cone shape and there can be other chambers leading off it. 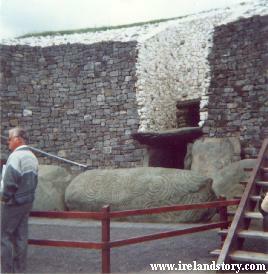 The most celebrated example is Newgrange, county Meath (see below). Perhaps the most interesting feature of passage tombs is their art. Stones both inside and outside them are decorated with swirls, chevrons, eye-motifs etc. These kinds of tomb are shared with Brittany, in western France. Although they originally had vertical sides faced with stones, most have eroded away to become nondescript earthern or rocky mounds. The picture on the left shows Newgrange, a passage tomb in county Meath. It is arguably the most famous passage tomb in the world, if only because the front half of it has been painstakingly restored to look as it probably did when first built 4,500 years ago. This date makes Newgrange at least as old as the Egyptian Pyramids and older than Stonehenge in England. The beautifully carved stones at the entrance make it a worldwide attraction, as does the fact that the Sun shines directly down the main passage at dawn on the winter solstice around December 21st. At the end of the main passage are three smaller chambers off the main passageway that may have been used for burying the dead. Newgrange is sited in the Boyne Valley - an area of Ireland that is rich with history. Knowth Passage Tomb lies 1km to the west, while the Battle of the Boyne was to be fought 5km (3 miles) east of Newgrange in 1690. Numerous other megaliths pepper the Boyne Valley. The picture on the left shows the entrance to Newgrange (image ©Wesley Johnston). Note the large entrance stone that must be circumvented in order to reach the entrance. This original stone is decorated with swirls and eye-motifs - a rare glimpse at Neolithic art. Above the entrance to the chamber is the roof box that lets the sunlight shine perfectly down the passageway on the winter solstice each year. This may indicate that Newgrange was used as much more than a tomb. External link: Check out Knowth.com which is an excellent portal to sites giving detailed information on Newgrange, Knowth and other megaliths. External link: The Megalith Map site contains a list of every megalith in the British Isles. 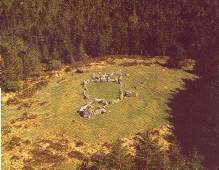 As will be evident, most megaliths in Ireland are situated in the north part of the island. However, there is a simpler form of Neolithic burial that has been found in the south. Called Linkardstown burials (after a site in county Carlow), they consist of a polygonal stone chamber, paved with stones, and enclosed by large stones that sloped upwards and inwards. A capstone covered the hole at the top. This was then covered in a small mound. Inside has normally been found the remains of just a single human. These 'Linkardstown' burials were on a much smaller scale than the megaliths, and thus not many have survived. Nonetheless, they do seem to be contemporary with their larger contemporaries . A Neolithic farmer would have lived in a wattle-and-daub house made from wood and thatched with reeds. An example of this is pictured at the start of this chapter. There would have been several such houses in a community, with perhaps 20 or 30 people living together. They would generally have confined themselves to the higher lands of Ireland, by clearing the upland forests wither by axe or by burning it. Field boundaries were created by laying out stone walls. Later in the Neolithic period, this land had begun to acidify and turn into the peat bogs that occupt these areas today. For this reason, some Neolithic farmers had to begin clearing forests in the lowlands. Each Neolithic community may have belonged to a wider group of communities that formed a tribe. These tribes may have traded with each other. On their farms they grew wheat and other grains, and kept cattle, pigs, goats and sheep. Unlike their Mesolithic predecessors, these people cooked indoors, by lighting a fire in the centre of their house. Meat was cooked on a spit over the fire or, for smaller cuts, by placing it on a stone and placing it directly in the fire. They cut their wheat using a sycthe made from a branch with sharpened porcellanite embedded along it. This wheat was ground by hand using a rounded stone on top of a larger grindstone. This was then used to make bread which was baked on top of a flat stone placed in the fire. There is some uncertainty as to how Neolithic people buried their dead. Scientists have found a great many human ashes in megalithic tombs, implying that cremation was common. In places where human bones have been found, these are often disjointed, raising the possibility that they were placed in the tomb some considerable time after death. Speculation is that bodies were left in the open to 'deflesh' before being placed in the tomb. They may not have remained in the tomb indefinitely, as they may have been removed to make way for later burials. There is evidence that land pressure was increasing in Neolithic Ireland as the population rose and the cleared upland areas became more populated. Some researchers have proposed that the megaliths were constructed partly as 'status symbols' to claim ownership over land. The Neolithic Age left a great mark on Ireland. The upland forests had been cleared for farmland, and by the end of the age they were starting to clear the lower forests. Sheep, goats and cows had been imported into Ireland for the first time. Megalithic tombs peppered the landscape. By the time Bronze was introduced to Ireland around 2000BC, Neolithic culture was evident across Ireland. Logan, Tinsley, Glasgow, Kelly and Todd: "Life in Early Times", Colourpoint Books, 1996.